Is Option Fair a Scam? 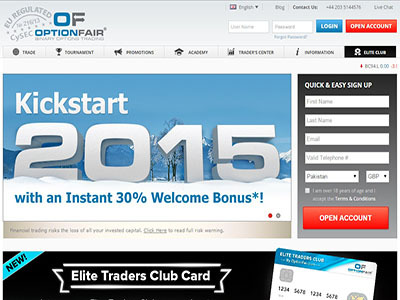 OptionFair is the binary options service of Finopex Group. They welcome traders from all over the world except the United States. OptionFair has the distinction of being one of the first to introduce a mobile version of the binary trading platform, allowing users to trade on their smartphones. Account opening balance typically starts from $200, but traders can actually start trading with as little as $100 in their accounts. OptionFair augments this with a generous bonus of 10-30%. Minimum trade amount is $10, and traders can operate accounts in US Dollars and Euros. Account opening is an online affair, after which traders are required to send supporting documents to Optionfair.com. OptionFair has a vast array of electronic funding and withdrawal options such as Liberty Reserve, UKash, CashU, Skrill, credit/debit cards from almost every major card processing company you can think of. OptionFair has the distinction of having developed advanced pricing algorithms that allow some of the most competitive pricing in binary options, and permits traders to trade on both sides of the asset. If you call them the equivalent of ECN brokers in forex, you would not be wrong. The range of assets that can be traded is unparalleled. Traders can make as much as 85% on every trade. 3) Commodities: gold and silver. 4) Stock index futures such as the IBEX, DJ30, NASDAQ100, FTSE100 and Xetra Dax. The asset index is a lot broader than what has been listed above. A more comprehensive list is available when traders open accounts. Traders can trade the following types on the web-based trading platform. c) Boundary Options: Traders are able to trade the In/Out options with OptionFair. Traders also have the option of using the option builder to choose the assets that they can trade. OptionFair has a customer support that is way ahead of its peers. Users to the support section are initially presented with a Frequently Asked Questions section, which addresses basic questions about binary options and their services. At the next level, traders can contact the multi-lingual support team via phone, email, or live chat. The customer support is very robust. OptionFair is a binary options trading brokerage registered in the British Virgin Islands and operates out of Cyprus. The brokerage, one of the finest in the industry, came into existence in 2010 and is said to be managed by a group of highly experienced professionals from the financial industry. They are regulated by the prominent regulatory body in the binary options industry, the Cyprus Securities and Exchange Commission. OptionFair has involved itself in a number of innovations since 2010 and has been successful in diversifying their product portfolio. In addition to this, they offer several different secure options to safeguard your transactions. It is an arguable fact that OptionFair ranks among the best three binary options brokers in the world. Their competitive pricing structure, payout system, wide array of funding and withdrawal options and robust customer support make them one of the most sought-after brokers. Most reviews you will get from traders who have used this service are positive. Until date, there have been no reports of traders encountering some of the problems that are commonplace with certain brokers. This is a good broker to trade binary options with.